This article is about the Keyblade. You may be looking for Jack Sparrow's special ability. "A well-balanced Keyblade that provides an extra boost to all your stats." Meet Sora and Riku on Destiny Islands. 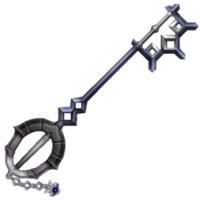 Stormfall is a Keychain for Aqua's Keyblade which appears in Kingdom Hearts II Final Mix and Kingdom Hearts Birth by Sleep. Aqua obtains it after visiting Destiny Islands. Aqua uses this Keychain in order to form her Keyblade Glider. In Kingdom Hearts II Final Mix, Stormfall is seen in Xemnas's Chamber of Repose, along with Aqua's armor. Xemnas talked to the armor, addressing it as "friend." The Final Episode scenario of Kingdom Hearts Birth by Sleep shows that Xemnas has had the armor and the Stormfall in his possession ever since Aqua sacrificed them to free Terra-Xehanort from the Realm of Darkness. They appeared alongside his complete being, Xehanort, in Radiant Garden when he was discovered by Ansem the Wise, Braig, and Dilan. The three took the Keyblade and armor along with them, as Braig carried an unconscious Xehanort. The Stormfall Keyblade's guard is circular and somewhat jagged around its edges. The upper half of the guard is black, the center is grey, and the bottom of it is white. The handle is a featureless, grey rod. The shaft of the Keyblade is thin and navy blue in coloration, except for the tip, which is silver. The base of the shaft also sports two diamond-shaped bumps. The Stormfall's teeth are comprised by a rectangular frame lined with four short, blunt spikes. This frame and the spikes are all navy blue. The teeth also have three silver pieces bent at right angles; two on the inside corners of the frame and one on the inside center of one side. The Keychain links and token resemble water drops. The Keyblade noticeably is a more straight and upgraded version of Rainfell. Stormfall as it appears in Kingdom Hearts II Final Mix. Stormfall as it appears in its Keyblade Glider form. This page was last edited on 18 April 2019, at 19:28.